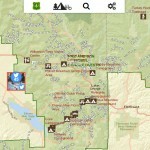 Hikers use the US Forest Service Visitor Interactive Map to digitally explore 158,000 miles of national forest. within a single app. If you have ever camped, hiked, or fished in a national forest, you probably picked up a visitor map at the forest’s office. The first-rate cartography of these pocket maps is sure to get you to your favorite campground or trail head. However, if you want to see the entire national forest system, use your phone or laptop to open the US Forest Service Visitor Map 2.0. Visitor Map 2.0 includes 193 million acres of National Forest System land and maps 371,000 miles of roads, 158,000 trail miles, and more than 24,000 recreation sites. What’s more, the amazing map is updated on a weekly or daily basis. 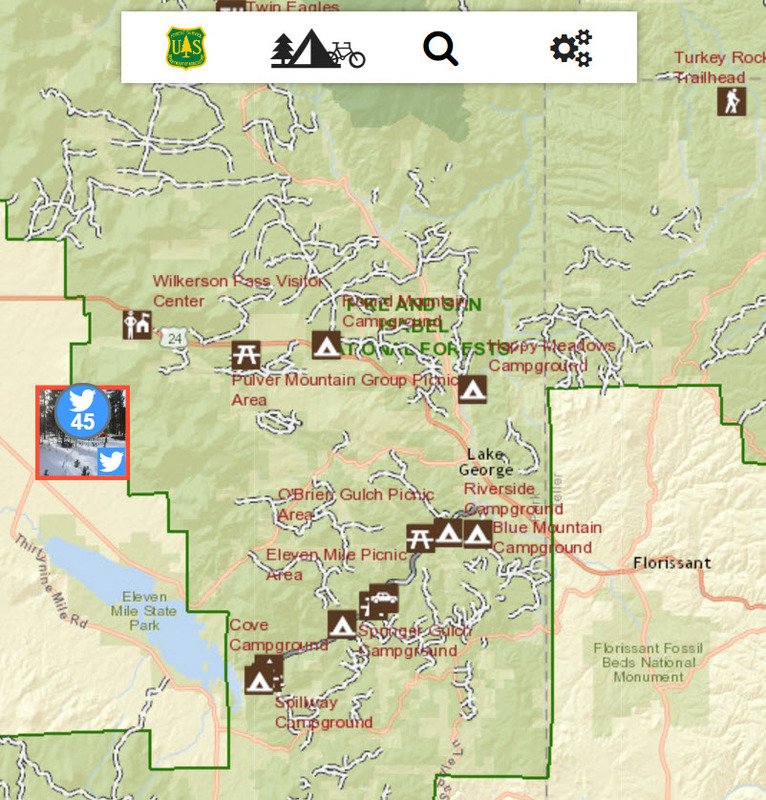 The map improves the public’s digital access to the Forest Service roads, trails, and recreation sites information through a friendly and easy-to-use map interface. The US Forest Service honored the project with the 2016 Chief’s Award because Visitor Map 2.0 furthers the agency’s strategic objective to connect people to the outdoors. The web map was built by the Forest Service’s Geospatial Technology Applications Center (GTAC) in Salt Lake City, Utah. The US Forest Service enterprise GIS platform, built with Esri software, gives foresters their own space to access data, perform analysis, and post internal applications. By using the platform in conjunction with the Esri ArcGIS Online platform, which includes a massive data library, users have a richer user experience. One goal of the project was to update the nation-wide map weekly or daily. Trail and campground information changes due to fire risk, wildfire, erosion, landslides, snow, and so forth. Roads are added while others are closed. Conservation activities impose habitat restrictions. New trail surveys may be more accurate. To keep the map’s data current, the team built a dynamic update process that reflects the updated data in the map. Visitor Map 2.0 consumes data from the Forest Service’s Enterprise Data Warehouse (EDW) in which the agency aggregates authoritative data from across the organization on a daily or weekly basis and publishes it as web services. Stanford noted that Visitor Map 2.0 covers the whole US and displays millions of features. To make this happen, his team made some difficult decisions about which data to display at specific scales and how to summarize data. In version 1 the team simply left the map largely blank until the user had zoomed in enough to see the rich density of its features. In version 2.0 the team took advantage of GIS clustering functionality to help users see more data in an area when they drill deeper into the map. In addition to weekly data updates, an inexhaustible research environment, and rich content, the Forest Services has enabled the map with social media by adding 120 of its Twitter accounts. It also has crowd-sourced media provided by Yonder, a mobile app designed around outdoor adventure and community. Now anyone can use the Visitor Map 2.0 to plan, discover, and document their outdoor adventures and then geolocate their photos and comments for people and friends to follow. Albert notes that the Yonder and forest map blend is a natural partnership that puts the focus on the outdoor experience and avoids distracting posts about celebrities or cute puppies. Since its release, Visitor Map 2.0 has been averaging 25,000 page views per month, a powerful success indicator. That number is increasing as the map becomes more integrated with national forest and grassland websites. It was the third most visited Forest Service website within three weeks of release. The US Forest Service has used Esri mapping software for many years to produce an array of map products for forestry planning, wildfire management, science, land management, and so forth. GIS users can access data via the agency website and use it for scientific analysis, forest management, and even to plan a Sunday afternoon picnic. See what the Esri ArcGIS platform can do for your organization.